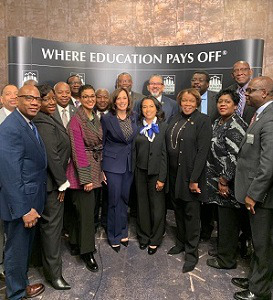 WASHINGTON— Historically Black colleges and universities’ role in molding students into leaders and public servants was on display Thursday morning during a Thurgood Marshall College Fund (TMCF) Congressional Fireside Chat with 2020 presidential hopeful U.S. Sen. Kamala D. Harris. Engaging with presidents and chancellors from TMCF’s 47-member institutions on issues of HBCU sustainability and competitiveness, the junior senator from California noted the influence her experience at her alma mater Howard University had on her life. Harris also highlighted several key legislative priorities she will be focusing on in Congress, including preserving historical buildings and sites on campuses, increasing Pell Grant awards for students and bringing more resources to the nation’s HBCUs in general. The D.C.-based HBCU was where Harris ran for her “first political office,” joined the debate team, chaired the economic society and pledged Alpha Kappa Alpha Sorority, Inc.
Harris connected this message to how legislators can better assist HBCUs in building capacity for research and workforce preparation for students. Particularly in emerging fields of artificial intelligence (AI) or machine learning, Harris said direct connections between HBCU leaders and leaders in Silicon Valley would be integral for building a diverse talent pipeline while similarly combating bias in AI. “Not only do we need to teach our students [how technology works] … but we also need to create consciously, specifically and with purpose, pipelines for our students to get into the industry,” she said, pointing to a previous HBCU partnership with Google called “Howard West” that brings Howard students to Google’s campus for coding and advanced technology training. And because a “significant number” of students – many of whom are first-generation – do not graduate on time, the senator added that leaders do not want them to make a “false choice” between attending school and foregoing a postsecondary education to secure a job early. “Students every day at our HBCUs are making that choice based on money, instead of opportunity and capacity,” she said. Part of that capacity starts with having up-to-date facilities for students, faculty and staff, and Harris has already put forth legislation to address HBCU campuses’ preservation. Last month, she and Sen. Lindsey Graham, R-S.C., reintroduced a bill to reauthorize the HBCU Historic Preservation Program for fiscal years 2019 to 2025. The bill would provide grant funding to restore older HBCU facilities and improve accessibility on campuses. The senator’s fireside chat came on the heels of an announcement introducing the bipartisan HBCU Propelling Agency Relationships Towards a New Era of Results for Students (HBCU PARTNERS) Act. Passage of the act would codify the President’s Board of Advisors on HBCUs and require federal agencies to strategically engage and invest in HBCUs. In addition, the agencies would have to report their progress and actions to Congress. ”Having all federal agencies formally develop and submit annual plans for increasing HBCU capacity building for grants, contracts and cooperative agreements to Congress so that Congress can hold them accountable is critical,” said TMCF president Dr. Harry L. Williams. Harris reinforced this point when asked what she would say to current political science students at HBCUs today. Her advice: “Stay the course. Learn and continue to learn about the history of policy and politics in this country” and get on the path to running for office.